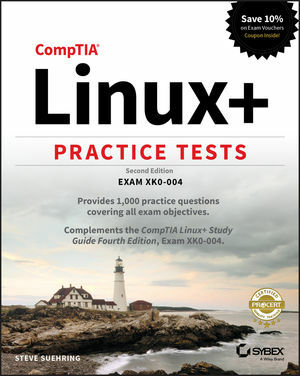 If you’re preparing for this all-important exam, turn to CompTIA Linux+ Practice Tests. The book covers the 5 objective domains, PLUS one additional 90-question practice exam, for a total of 1,000 practice test questions. Readers will also get one year of FREE access to the online test bank where they can study and work through the questions, reinforcing their skills and knowledge. Study for the CompTIA Linux+ certification with Sybex and get the advantage of exam day confidence. Linux is a UNIX-based operating system originally created by Linus Torvalds with the help of developers around the world. Developed under the GNU General Public License, the source code is free. Because of this, Linux is viewed by many organizations and companies as an excellent, low-cost, secure alternative to expensive OSs, such as Microsoft Windows. The CompTIA Linux+ exam tests a candidate's understanding and familiarity with the Linux Kernel. As the Linux server market share continues to grow, so too does demand for qualified and certified Linux administrators.